Zoodles are the new black. 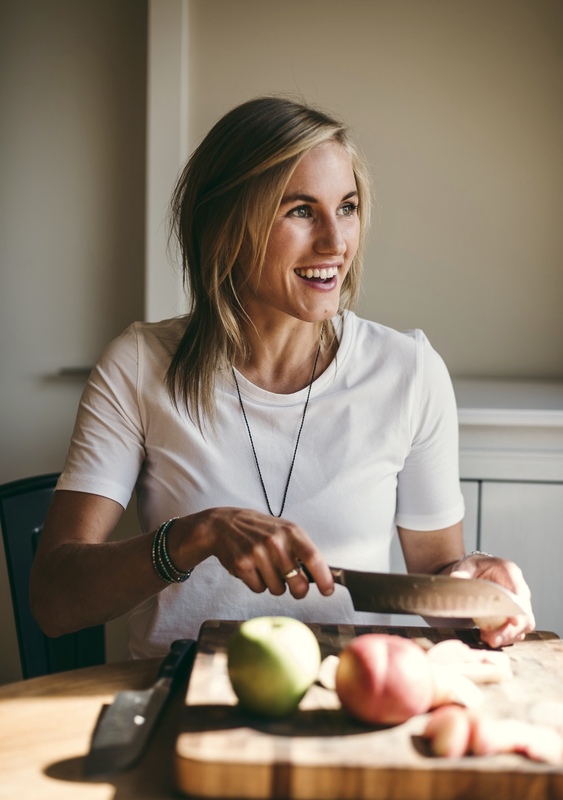 If you don’t have a spiralizer for your kitchen yet – you have got to invest in one. Yes, it makes noodles out of your favourite veggies, but more importantly … the satisfaction you get from cranking the handle is something you just have to experience for your self. I giggle the whole time. I have something like this one, but you could always go for a hand-held version like this. 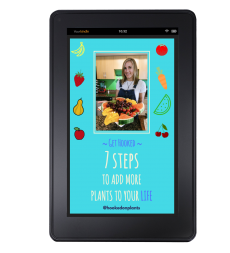 Spiralizing zucchini, squash, yams, carrots, beets, cucumbers… can create a main dish or even a garnish to a meal that will create plate so professional looking that you’ll have to fight the urge to take a picture and share it with the world. 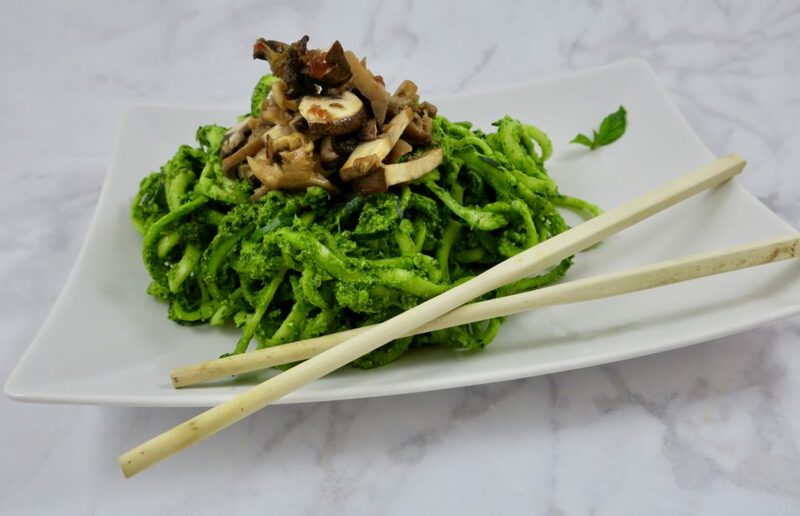 Eating zoodles, rather than your typical spaghetti, will give you a mountain of unprocessed nutrients, in fewer calories. Nutrient density people! That’s what we’re looking for! What does this mean? You can pile your plate high with this stuff, and you’ll be all getting the fibre, water, minerals, vitamins you need, PLUS feel free to eat as much as you like! No skimping on this ‘pasta’ dish. As for the KALE PESTO. Oh my. 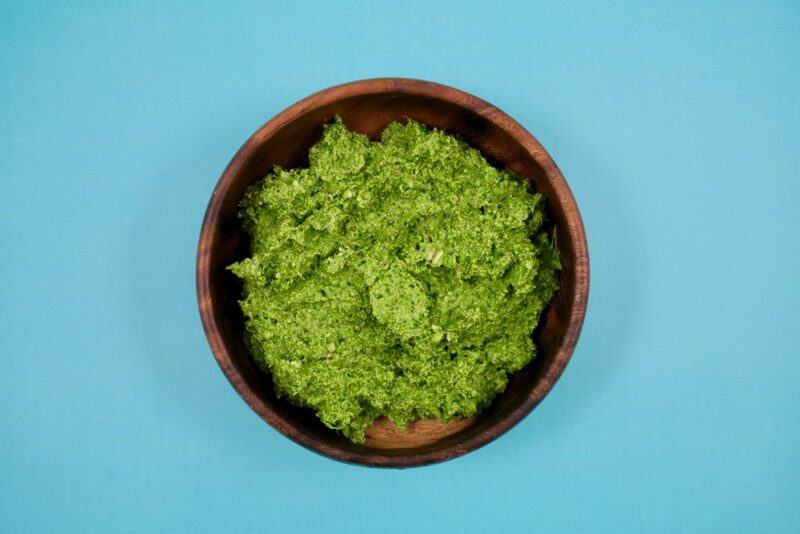 Most pesto has a lot of oil, nuts, and parmesan cheese. But not this delicious sauce. 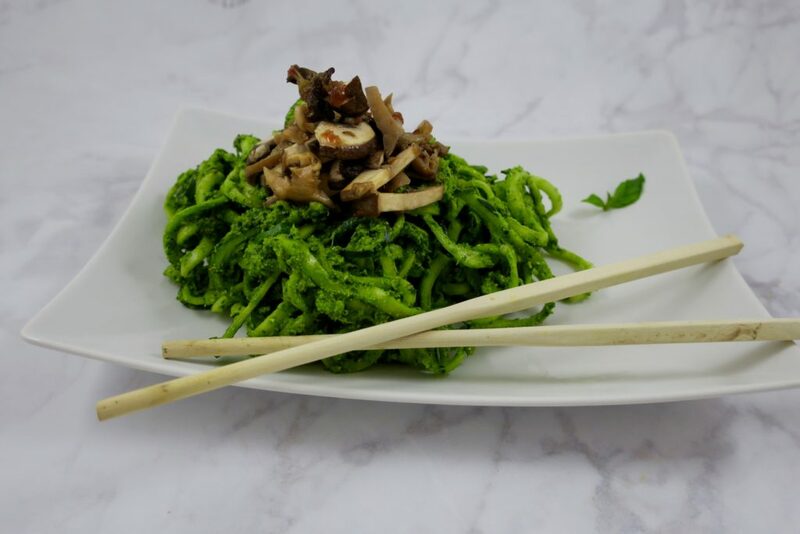 Instead of going overboard on the nuts, this pesto features avocado as well. It’s a winner, this one. 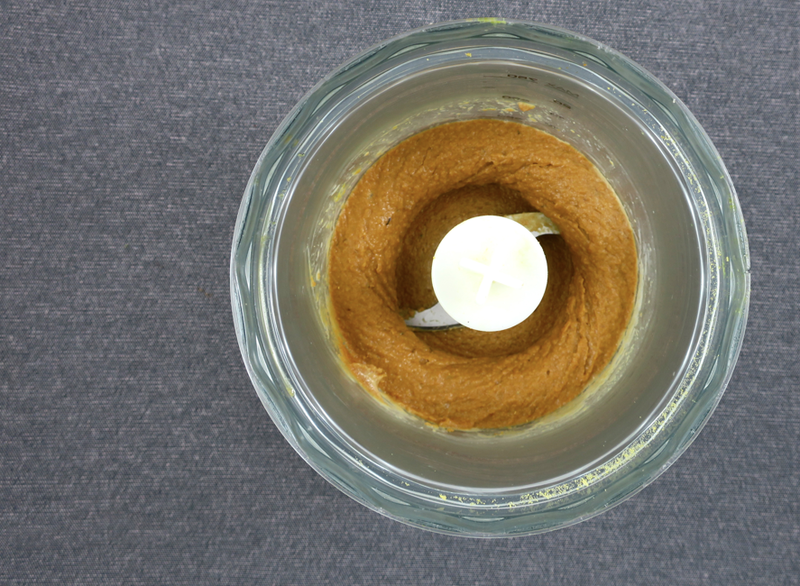 In the raw-food world, marinated is a perfect trick to create super flavourful ingredients, without the heat of cooking. You’ll see when you marinate the heck outta these wild mushrooms. Flavours to the MAX. Adding raw foods to your diet is super beneficial. The closer to unprocessed in this processed world we can get, the better. Raw foods are living foods, with all of their nutrients still in tact, and ready to be absorbed by your wonderful body, and create clean energy for all of your systems. 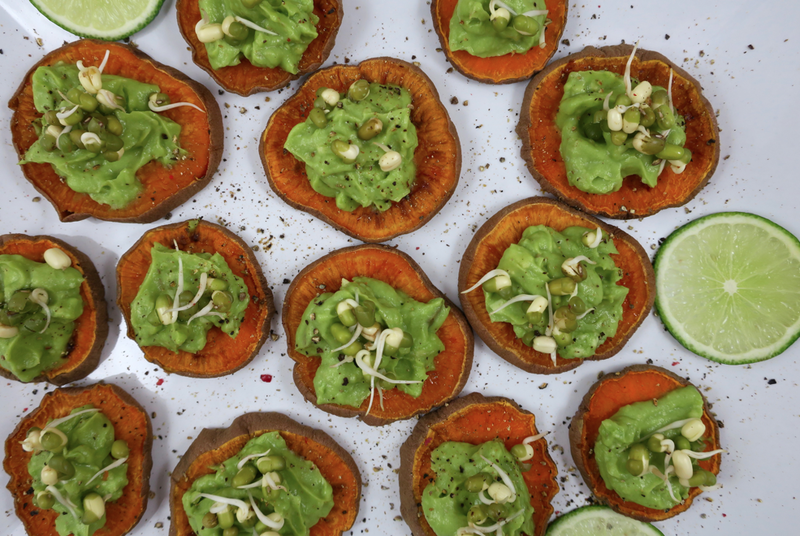 So, here is a great raw vegan entrée you can devour to increase your immunity, energy, and bring a glow to your skin, hair and nails. Zucchini surprisingly has a high content of omega-3 fatty acids, zinc, niacin, and protein! Eating zucchini in it’s raw form will give you tons of fibre and nutrients, yet be low in calories. A great combination for weight loss. Not to mention the vitamin C is has for your immune system and B vitamins for blood sugar regulation. Kale…. all hail the kale! Unless you’ve been hiding under a rock, you know kale is good for us. A cruciferous, dark, leafy green. What more could you ask for? It’s packed with fibre to help with digestion and elimination. It’s got Folate for your brain, vitamin C for your immunity, vitamin K for your bones and heart, and vitamin A for your eyes, PLUS 3 grams of protein in just one cup. Mushrooms (of your choice) are high in vitamin D, and antioxidants! This will help with depression, and combatting disease. CRVAN-MURJUB is my code for you to get 20$ off your first Spud delivery. Worth a try! It’s local, organic and so easy. 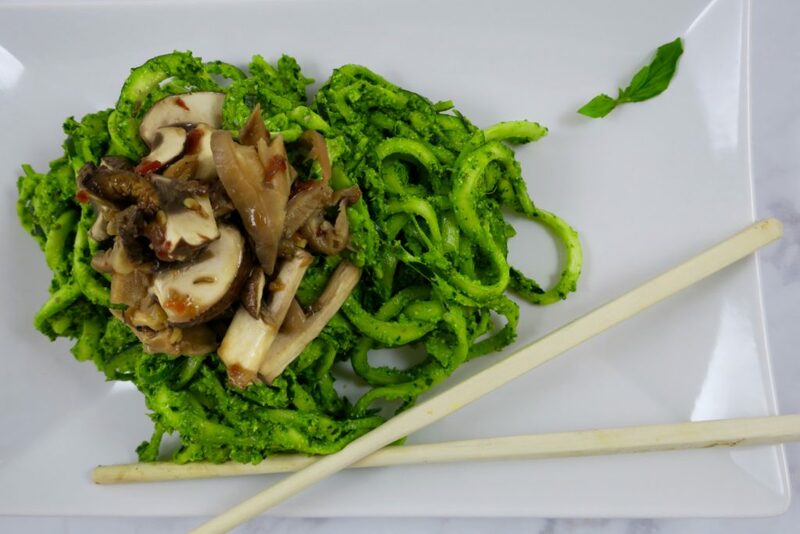 Spiralize your zoodles! Then let sit in a strainer while you prepare the rest. 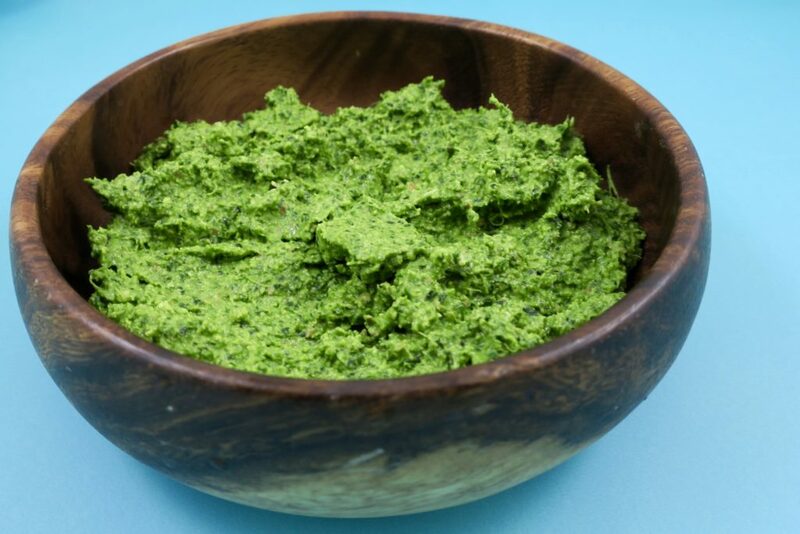 Make pesto: in food processor, first blend the almonds into a flour (or close to it), then add in the rest of pesto ingredients together in food processor and blend until smooth, scraping down the sides when needed. Mix together the zoodles and pesto. 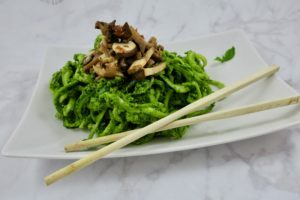 Serve with marinated mushrooms on top! Simple and flavourful. 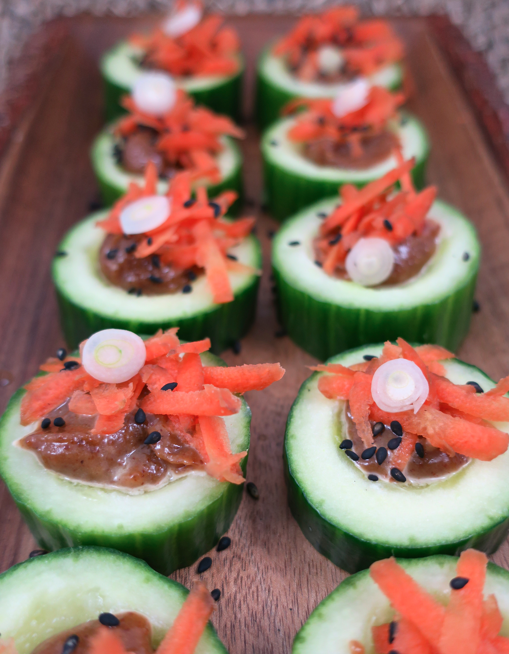 Perfect for your next canapé party. Because you throw those all the time, right? 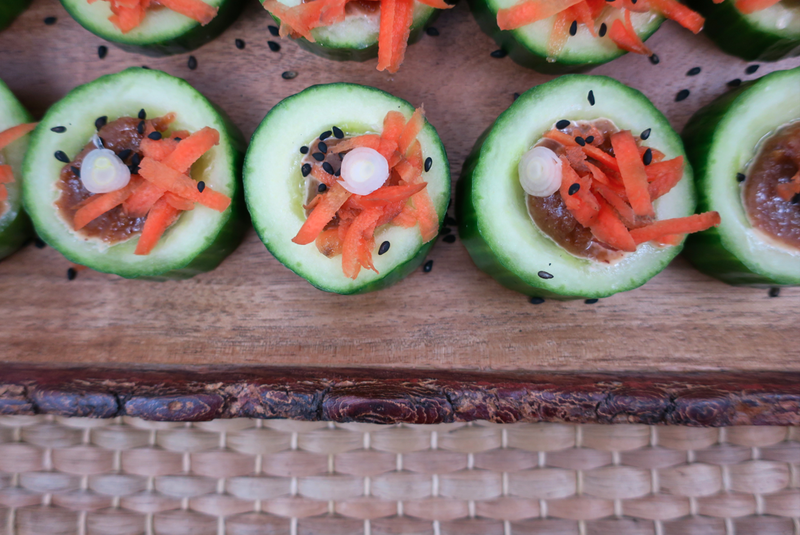 These little cucumber cups are wayyyy too easy to make. If you need to throw something together quickly and impress some taste buds, look no further. The crispy, fresh cucumber with the creamy, smooth almond lime ginger butter is a FANTASTIC contrast and a surprise burst of flavour. The butter is a bit like thai peanut sauce, but has more of a tangy punch. 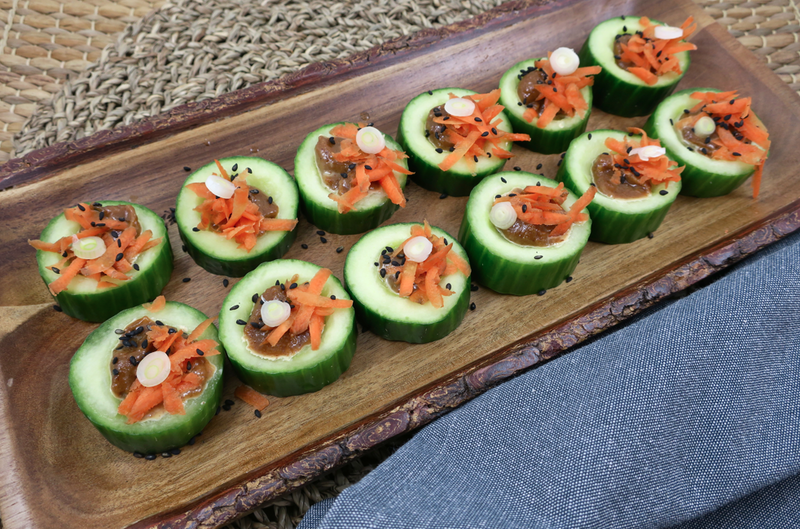 Cucumbers are super hydrating and packed with vitamins and minerals. Eat the green skin people! The anti-inflammatory flavonol, fisetin, plays an important role in brain health. The antioxidants will combat disease, and the B vitamins will help lower stress. Miso is a fermented food, which means it will do wonders for your gut bacterial health. Miso (and other fermented foods like kombucha, sauerkraut, and kimchi) will help restore the beneficial probiotics in your intestine, which then will improve mood, digestion, absorption, immunity and reduce risk for many diseases. Carrots as most of us know are very high in beta-carotene which is then converted to Vitamin A in the liver, which will help your vision. It’s also converted into an antioxidant, which combats disease and helps oxidized cells, therefore, slows down aging and helps the skin. So, eat them up! Slice cucumber discs 1/2 inch thick. Then spoon out the middle to create a cucumber cup (don’t scoop all the way through). 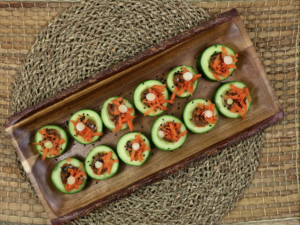 Sprinkle each cucumber cup with grated carrot, sesame seeds and green onion. **Note: The almond lime butter can be made into a sauce by adding water until desired consistency. This will make an amazing ‘Glory Bowl’ dressing! Alternatively make it into a dip by adding a bit of water and 1/2 of a zucchini ! Talk about a burst of heaven in your mouth. These bites have it all. Some of the best creations are just a few delicious and complementary ingredients. 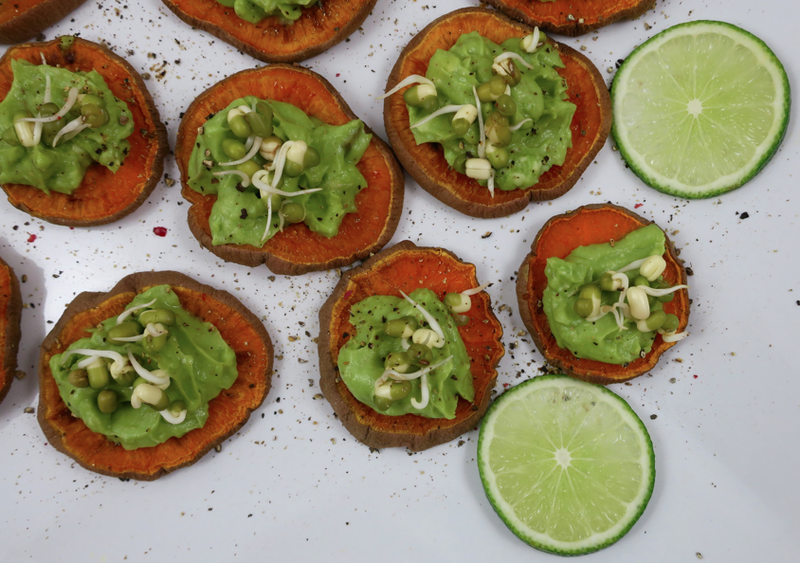 After some easy steps of roasting, mashing, and assembling, you’ll have a vegan appetizer that will impress even the fanciest cook. The warmth and chewiness of the sweet potato along with the creamy guacamole and crunchy mung beans…let’s just say it’s a party in your mouth. These are a great start to any shindig. Mung bean sprouts are high in vitamin K (for healthy bone density), C (immune boosting), and folate (for healthy blood cells). All raw sprouts are total superfoods. 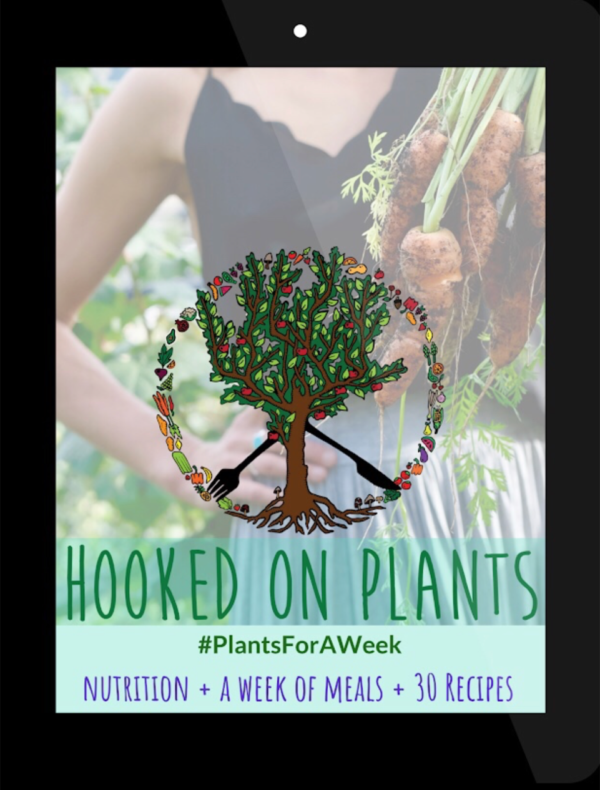 Since they have started their growing process, they are an easily digestible, living food with more nutrients per calorie than any other food. 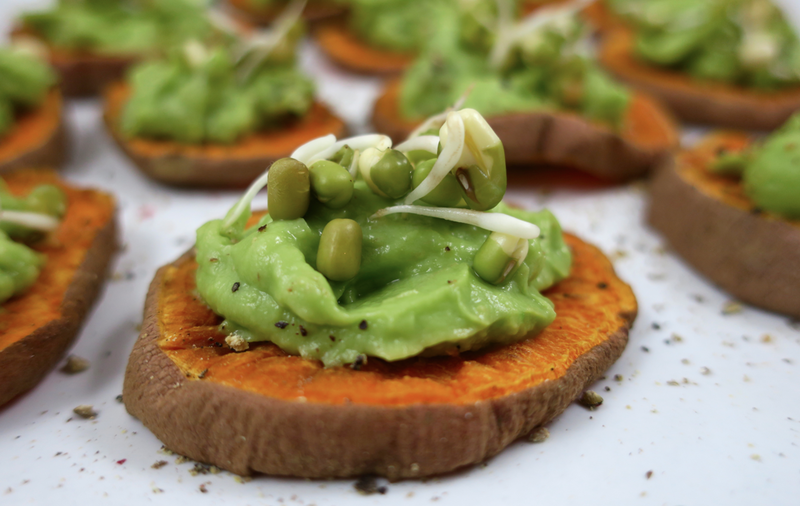 Sweet potatoes have been a staple in the diet of some of the longest living peoples in history (Okinawans). 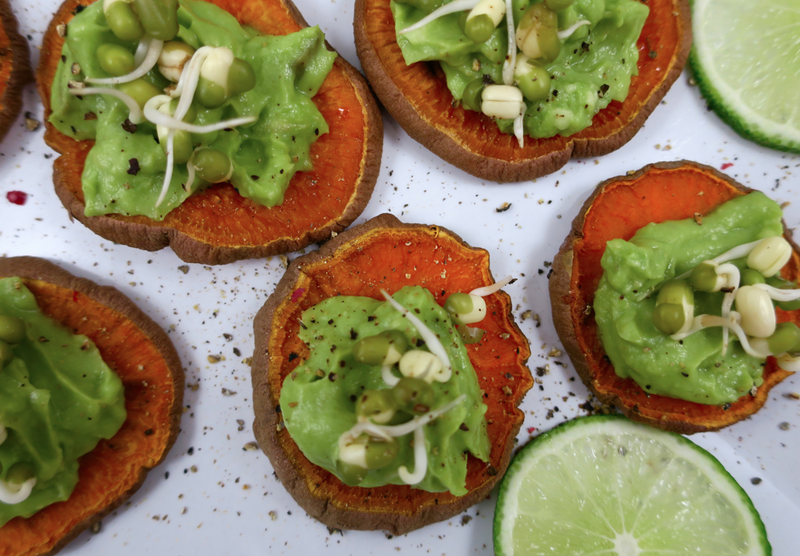 They have more Vitamin A than any other food, they are packed with healthy carbohydrates, antioxidants, and are stars for combatting inflammation and oxidation. Eat em’ up! I always get delicious, organic sweet potatoes from Spud to my door every Tuesday. Man, I love Tuesdays!! Use my code CRVAN-MURJUB for 20$ off your first order. Avocados are packed with monounsaturated fatty acids. Great for the hair, skin and nails! Meanwhile, prepare the guacamole: mash the avocados with garlic and lime juice. Assemble the artwork. 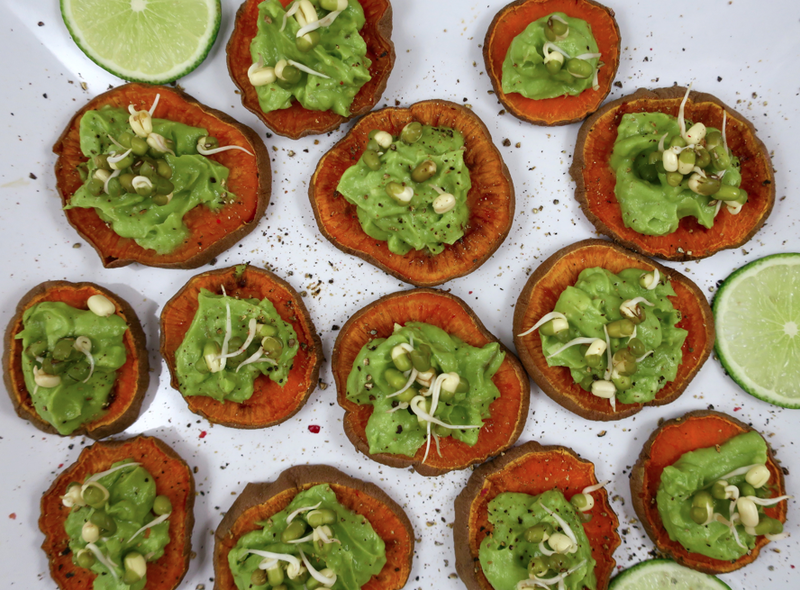 Place sweet potatoes on a plate with a dollop of guac, and a few sprouts.